Today, your hopes and dreams are no different. Like most people, you probably want to buy a home, put your children through college, and retire with a comfortable income. But the world has become a more complex place, especially when it comes to your finances. You may already be working with financial professionals--an accountant or estate planner, for example--each of whom advises you in a specific area. But if you would like a comprehensive financial plan to help you secure your future, you may benefit from the expertise of a financial advisor from Portland Harbor Group. You might not expect your financial advisor to be there when a pipe burst, to help with wedding plans or pick up the phone when you need to hear a reassuring voice. But maybe you should. After all, there’s more to your goals than an investment portfolio or retirement plan can account for, so there should be more to your relationship with your advisor. That’s why, in addition to our knowledge of financial and investing, the biggest part of our job is to become expects on you. We can help you fit all the pieces of your financial life together as easily as we can help you decide which new car is the best fit for your family. However, you don't have to wait until an event occurs before you consult a financial advisor. 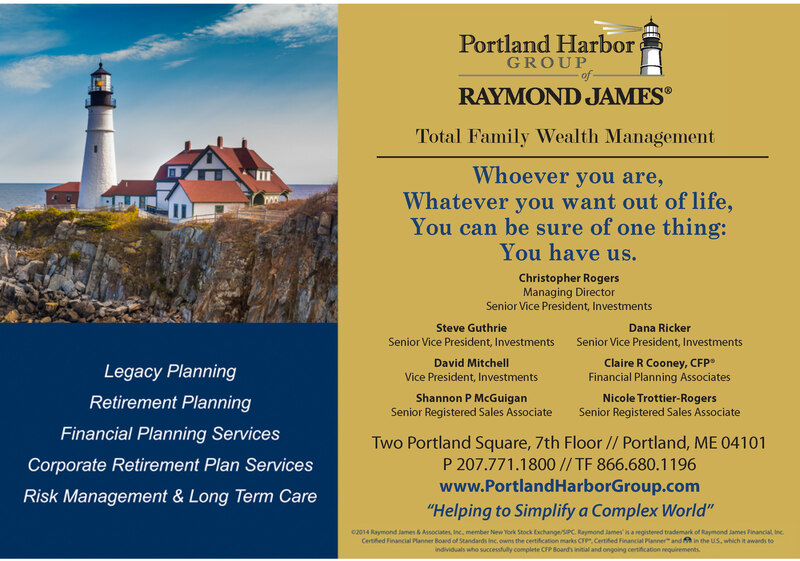 The Portland Harbor Group of Raymond James, can help you develop an overall strategy for approaching your financial goals that not only anticipates what you'll need to do to reach them, but that remains flexible enough to accommodate your evolving financial needs. • Most people don't need financial advisors--While it's true that you may have the knowledge and ability to manage your own finances, the financial world grows more intricate every day. A qualified financial advisor has the expertise to help you navigate a steady path towards your financial goals. • All financial advisors are the same--Financial advisors are not covered by uniform state or federal regulations, so there can be a considerable disparity in their qualifications and business practices. Some may specialize in one area such as investment planning, while others may sell a specific range of products, such as insurance. A qualified financial advisor generally looks at your finances as an interrelated whole, and can help you with many of your financial needs. • Financial advisors serve only the wealthy--Some advisors do only take on clients with a minimum amount of assets to invest. Many, however, only require that their clients have at least some discretionary income. • Financial advisors are only interested in comprehensive plans--Financial advisors generally prefer to offer advice within the context of a client's current situation and overall financial goals. But financial advisors frequently help clients with specific matters such as rolling over a retirement account or developing a realistic budget. • Financial planners aren't worth the expense--Like other professionals, financial advisors receive compensation for their services, and it's important for you to understand how they're paid. But a good financial advisor may help you save and earn more than you pay in fees. The Portland Harbor Group of Raymond James takes an approach to financial planning, investment management and personal service that are highly sophisticated, thoroughly analytical and deeply human- we can weigh the numbers and the markets in terms of your current needs and lifelong goals to create an overall wealth strategy that is precisely yours. We use a three steps process: The Financial Plan, Investment Plan, and Service Plan. First we establish goals and objectives. Then we craft investment strategies that address your goals and objectives. Using five portfolio models, we use a tactical approach that attempts to reduce risk. Lastly, we use a detailed personal service strategy to keep you informed of your progress toward your goals and apprise you of where your asset allocation stands at points along the way. Applied specifically and personally, the services we offer can help you plan for success as you see it, whether it includes a second home on the coast or a financial legacy for generations to come. Our comprehensive services include: Financial planning, retirement planning, educational planning, estate planning, insurance/long term care and corporate retirement plans.